氣內臟 Chi Nei Tsang (Internal Organs Energy Transformation) is a holistic approach to health discovered and developed thousands of years ago in the mountains of China, to help the Taoist monks acquire the energy necessary to achieve the highest levels of meditative practices. Adapted for practical use today, this practice mostly revolves around using safe, deep and gentle touch applied directly to the abdomen. The abdomen, or tan tien (Dantian 丹田) in Chinese and referred to as the hara in Japanese is the center of our body and the place from which our power, vitality and movement originates. 氣內臟 is the art of internal organs Chi (Qi energy 氣) transformation. By working gently and directly on the abdominal organs it is possible to help release physical toxins from the body, clear emotional charges that are stored in the organs, and consequently unwind tensions that are manifesting in other parts of the body. This allows the body to return to its natural state of good health. Chi Nei Tsang 氣內臟 is a truly holistic therapy in that it integrates the physical, mental, emotional and spiritual aspects of our being through the power of touch and breath. Chi Nei Tsang’s power is in its abiltiy to reach the very origin of health problems, including psychosomatic responses. How can Chi Nei Tsang help me? 氣內臟 CNT helps restructure and strengthen the body. CNT 氣內臟 helps practitioners become more aware of the quality of their emotional life. 氣內臟 CNT teaches clients to know themselves better. Who needs Chi Nei Tsang? This Taoist internal massage is recommended for everybody. Most people have gone through a time in their lifespan when they Chi has been halted. Infants experience blocked Chi as Colic. Children experience blocked Chi as illness or tummy aches. Teens frequently hold excess toxins and negative emotions from hormone imbalances and/or poor eating habits. Any adult who feels stress, trouble, or anxiety without consciously relieving the excess negativity may benefit from CNT. Flush toxins from the liver, lymph, kidneys and colon. Stimulate the lymphatic and circulatory systems. Release the blocked energy that can manifest as tiredness or chronic fatigue. Relieve back, shoulder and muscle tension. Asian Massage Center. Madrid. 按摩马德里 Believing In The Connection Of Mind, Body & Spirit. Chi Nei Tsang is a holistic approach to the healing touch modality of old Taoist Chinese origin. It is not easy to trace any organized establishment of the Hilot phenomenon. In the first section of this article, we alluded to the simple and instinctive “rubbing where it hurts” and the consequent recognition of patterns of causes and effects. What can really drive our curiosity is the aura of secrecy with which manghihilots seems to cloak their healing skills. In general, Filipino healing traditions – including the centuries – old Hilot – appear to be shrouded in mystery and secrecy. This is more because those who have received the gift are not articulate in technical communications. They attribute their healing skills – rightly so – to a higher power. In search of an adequate presentation of skills and powers that are beyond their own comprehension, manghihilots of old have ritualized their healing activity, using the native animistic beliefs and vocabulary of their era, while discovering more cause-effect relationships along the way. And so, what may appear to some as superstition is really the manghihilot’s in articulate attempt to modestly attribute the power to God (or a higher being). Amulets and anting-antings are statements of attribution. The proof of this modesty is that authentic manghihilots do not charge fees. Surprisingly, the rituals, chants, and oraciones somehow serve to predispose the sick person mentally and physically towards healing. Admittedly, some persons do venture into deeper spiritism. But whether external powers and principalities do intervene is a matter for further investigation. Learning the causes and beneficial effects of rubbing takes years. No wonder the manghihilot stereotypes are typically old men and women. There are, however, some amazing cases of prodigious children whose powers are undeniably gifts – i.e., acquired with minimal or no training at all. On top of these processes of discovery, we should add the influences of Chinese, Indian, Islamic and Western healing traditions. And so what do we have? An evolution of diverse beliefs and practices regarding health that have stood the test of time. Despite its widespread influence, Hilot is a little-understood mode of healing. Individuals who have experienced Hilot cannot explain how and why they got well, only that they felt better after the Hilot session. Asking a traditional Hilot practitioner may just yield more questions, because in all likelihood, the albularyo or manghihilot (traditional healer) will explain Hilot as he learned it–through espirito (spirit), encanto (elementals), and kulam (spells). This is part of the reason why Hilot, as a healing tradition, began to be looked upon with skepticism as conventional western medicine–with its emphasis on science and empiricism–rose to prominence. The Four Elements of the Body. When it comes to the physical body, the Hilot tradition abides by the belief that man is made up of the four elements–earth, water, air, and fire. These elements of the body have a natural balance, which has to be kept within a certain range for the individual to be in a state of health. The balance of the four elements is determined by the mind/emotions–in a state of harmony, the four elements are balanced. In a state of disharmony, the elements of the body are in disarray. When thrown off-balance for extended periods, the elements of the body eventually give in to physical ailments and disease. Today there are many versions of traditional hilot massage in the Philippines. For now, let’s take a quick look at what is common among them. A pre-hilot ritual is typically done at the beginning of a session, wherein the manghihilot invokes a universal transcendent or Divine power to provide the energy for healing. This opening ritual also acknowledges and invokes the natural power of the natural surroundings. Thirdly, it summons the sick person’s inherent self-healing powers to action. Having and maintaining warm hands is an essential requirement for all kinds of hilot massage. This is where coconut oil comes in handy, because it not lubricates the hilot massage, but it actually keeps the manghihilot’s hands warm. The use of coconut oil for healing purposes began in the Philippines, and the world is only now discovering the benefits of VCO as a base oil for aromatherapy massage. Elizabeth F. Nelle, director of product research and development of the DOT says that hilot is a highly intuitive massage wherein the therapist identifies areas of energy imbalance in the body through touch diagnosis. Traditional Filipino hilot involves massaging of hands and arms as a diagnostic step –“pagpupulso” – done in a seated position, to ascertain the cause of pain or discomfort. There are a number of interesting diagnostic methods. Thereafter, the manghihilot massages the head and neck; subsequently, in a reclining position, the torso, hips, legs, and lastly, the feet. At the end of the hilot, a ritual of thanks or pasasalamat is performed. On one hand, the entry of Hilot into the spa industry was good, because it revived interest in Hilot, especially in urban areas where very few people know or have access to it. On the other hand, however, Hilot’s rise in popularity in the spa industry has also attracted many players who are not actually knowledgeable on traditional Hilot, but want to join in on the Hilot bandwagon. As a result, there are those who perform ordinary massage which do not follow traditional Hilot principles, but label it as “Hilot.” Unfortunately, this reinforced the view that Hilot is no more than just a type of massage. This is also a cause of concern, because there are people who go to the spa hoping for relief from their aches and pains (as one would expect with real Hilot), but come out from the treatment even worse off, because the manipulations they received were far from the real practice of Hilot. Hilot Wellness, when performed correctly and according to the principles of traditional Hilot healing, truly improves an individual’s well-being. One just needs to make sure that the therapist who will perform it is well-trained, and has experience in applying this treatment modality. There are also a host of indigenous Filipino treatments or “modalities” that are associated with hilot. These healing practices have been passed on not through institutional instruction, but by apprenticeship or plain exposure, and are passed on to relatives and neighbors. Hilot traditions have literally “rubbed off” from generation to generation. Hilot helps determine your general health condition. Hilot addresses the health of your whole being. Helps prevent potential health problems. Hilot is the lazy man’s exercise. Hilot does for your body what a “tune-up” does for your car. Works in tandem with all-natural herbs and proper nutrition. Fosters awareness and appreciation of your body. In Vietnam, massage has been practiced as a medical method of preventing and treating diseases for thousands of years. Throughout Vietnamese medical history, many Oriental therapists in have written therapeutic massage books. Massage has played an important role in treating and preserving people’s health. Practiced for centuries by the people of Vietnam, the Vietnamese traditional massage is an amalgamation of two forms of massage from the north and south of the country. Have the logical influences from tuina chinese massage and thai massage, because are very much nearly from those countries and cultures.. It uses the pressure of the fingers, palms and vibration. A traditional Vietnamese massage, also known as “tam quat,” (Tẩm quất) and Dâm Bop Tâm Quât… is an intense yet refreshing experience. Although less popular than its Thai massage counterpart, Vietnamese massages can relax a body in a way like no other. Build strength and endurance. A Vietnamese massage is known for being powerful and initially tough on the skin and body. The benefits for your partner come after the session is done. As the masseuse, your entire body needs to be fully ready for the challenge before you even think about giving this type of massage. Lift weights and include cardiovascular activity in your routine so that your massages will be strong and will be able to last the full 60 minutes of a typical Vietnamese massage session. eight of your whole body to apply as much force as possible. Take advantage of gravity to hit your partner’s body with plenty of energy. Dig in by positioning your body over your arm so that your weight transfers to that specific spot. Give a hard rub to finish off the movement, and then prepare for the next area of her body. Pull as much as you push. European people are accustomed to massages that involve using pressure, but Vietnamese massage takes it one step further and also incorporates a lot of pulling. Tugging at the limbs is a different way of encouraging blood circulation and also helps to reset joints. Hold your partner’s limb at the wrist and elbow or ankle and knee, and pull toward you. Also try slightly twisting the limb and pulling in various directions. Make sounds. The intensity of a Vietnamese massage is partly due to the various groans and shouts that the masseuse makes while carrying out the techniques. There’s more power in a movement when you exhale and let your voice loose. When you make contact with the skin, release a grunt or a roar that signifies the effort you’re putting into the act. Each movement should be accompanied by its own sound. The combination of skin pounding and slapping with your vocal exhalations is what makes the experience exciting for your partner. 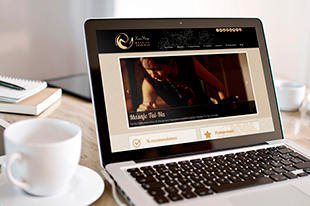 Experience the magic of indulgence, vitality and relaxation with this Vietnamese massage. It is based on hand pressing and arm stroking techniques, performed in an empathic manner, in which the masseur does not decide on your behalf, how deep or intense the massage should be, but instead listens and tunes-in to your bodily needs on that particular moment and responds accurately. Then you feel heard, respected and glorious. Vietnamese Massage techniques are different from those you know in western countries. Vietnamese masseuses do not hesitate to walk on your back directly to get a better effect. It’s stronger and harder. It includes three types of manual operations, namely the mixing, kneading and vibration techniques. The practice is done both soft and hard manner. The therapist, use strongly pressures of palms and fingers, sometime their feets are used. The major lesson from this Vietnamese massage is: be generous to yourself. 什么是泰式按摩? What is Thai Massage ? Thai massage originated in ancient India, the West , the founder of the ancient Indian king physician Jivaka Kumar Bhaccha , he has still regarded as the father of health of the Thai people . His knowledge of traditional medicine knowledge and massage techniques brought by the missionary monk in Thailand by Thai King summoned , they absorb a wide range of traditional medicine and massage valuable experience , these experiences etched in marble, inlaid in瓦特波of the Reclining Buddha veranda wall. Traditional Thai massage here to become a base for training . 1. concentric : Thai massage is generally started from the foot , to the point of pressure in the central part of the body , according to a combination of massage techniques . 2. delicate nature : use more delicate Thai massage acupressure , focusing on human limbs and large muscle groups push kneading repeated stretching , so that the power of the palm evenly penetrate deep into the muscle to play the dredge meridians, qi and blood effects . 3. joint mobility : refers to the pressure applied by a wide range of neck , waist, rotating four fingers , and twist anti- pull back method and other techniques , played joints , Shujin role. 4. treatment , care duality : Thai massage has obvious fatigue, muscle relaxation , mediation and other emotional effects , while muscle damage , gout, and inflammation have significant effect. Massage is a specific part of the body surface , penetration through the skin by way of physical stimulation , applied to the muscle, fascia , tendons, bones and joints, nerve, blood vessels, and other lymphoid tissue , and the regulation of body fluids through the nerves and soft tissue and bone and joint adjusted to produce a series of physiological and pathological changes , leaving the body to restore function to play the purpose of treating disease. 1. Release adhesion , adhesion of the muscles and tendons can be separated . 2. Improve muscle blood circulation, promote the discharge of creatine and other metabolites. 3. Muscle tension can increase the solubility of metabolites , relax muscles , relieve fatigue. 5. Can regulate human blood , aid digestion . 6. Full- body massage action almost human again, gentle gentle way , people ease the tension. 什么是灸感？ What is moxibustion sense? Chinese massage What are the benefits? Meridians throughout the body, the organs are outside the network in the limb, communication and link all the body’s organs, organs, orifices and fur, muscle, bone and other tissues, blood running through the meridians, the composition of the overall link . Manipulation effects on local surface, the partial flow of Qi and blood, moisten bones, and because the distribution of blood flow injection follow the body meridians, can affect internal organs and other parts. Such as rubbing the back of eleven, twelve paraspinal open a half inches of spleen, stomach Yu spleen and stomach, according to point Hoku can stop a toothache. It can be seen, massage treatment is painful to lose not only, but also must be based on the principles of meridian linked, acupoints along meridians. Modern medicine, massage and physical stimulation, so that the role of district biophysical and biochemical changes induced, localized tissue physiological reaction that, by reflex and humoral regulation of circulation, on the one hand be strengthened, on the other hand causing the overall secondary reactions, resulting in a series of changes in the pathophysiological process, to achieve a therapeutic effect. Through the nerves , body fluids , manipulation of the overall local operations and other organizations can have an effect . Massage can adjust the nervous system excitation and inhibition relative balance . But lighter approach to ease rhythm , repeated stimulation , inhibition of nerve sedative effect . Rapid heavier, shorter approach, the role of the nervous excitement . After the massage was observed EEG changes , see a wave amplitude increases, the time and amplitude increases continuation of this phenomenon may be caused by the suppression of the development of the massage caused . According spinal segments reflection , massage neck, upper limb and the brain can regulate blood circulation , reduce intracranial pressure , and lower blood pressure ; thoracic department at l ~ 2 , vibration and percussion techniques, can cause cardiac reflex , the performance of myocardial contractility ; vibration tapping 1-2 lumbar , pelvic congestion can make small ; Chiropractic , which can cause stomach and intestines faster ; pressing sympathetic stellate nodules Quepen caves , can occur pupil dilation, blood vessels diastolic , ipsilateral limb skin temperature increased ; abdomen and inner thighs under massage , can cause bladder contraction and voiding treatment of urinary retention ; abdominal massage can promote gastrointestinal motility and digestive gland secretion. Massage can still cause changes in blood composition and metabolic. Laboratory proof: After the massage phagocytic leukocytes and increased leukocyte changes increased the proportion of lymphocytes, red blood cells slightly increased serum complement titer, oxygen requirement, ranked nitrogen excretion, urine output and carbon dioxide also have increased. In summary, the role of massage, mainly to improve the body’s function, but it is not only therapeutic massage functional disorders of organic diseases powerless. We know that the so-called organic disease and functional lesions, can not be cut. We offer different kinds of massage in our Center in Madrid, Spain. You can choose between: Body massage with oil, Thai massage, Tuina massage, traditional Balinese massage, Foot massage or Cupping massage. 預订酒店按摩服务! Best oriental massage ! The four hand massage may be the best choice because the benefits are very similar as other massage styles, but the relaxation and pain relief may arrive more quickly because twice the work is being done to the body. Many people enjoy four hand massage because they find it extremely effective and relaxing, and they enjoy the sensation of being pampered by two massage therapists. Four-hands-massage is also healing for our minds as well as our bodies. Having an extra pair of hands do some bodywork can create a different sensation in our minds. At first, our mind tries to figure out who is doing which motions but as time goes on, we start to let go and give our minds a rest, allowing our bodies to drift into a deeply relaxed state. A four-hand massage is perfect for the overworked clients that need lots of care. Our “four hand massage” it´s Balinese massage inspiration for Wellbeing. Why get a Four-Hands Massage? When two therapists and four hands hit your body, your mind reacts differently. At first you might find yourself trying to keep track of the therapists, where each one is and what each one is doing, struggling to keep it all in a very logical order in your head. But very quickly your brain realizes it’s not sure who is doing what, and gives up control. This is a powerful treatment for anyone who has a hard time letting go during treatments. In Our Massage Center in Madrid you will enjoy the pleasure and relaxation of having four hands massaging you at all times during the session… and now… We have this massage in Offer for your pleasure and wellbeing. For more information about the therapeutic and relaxing massages in Madrid visit our web site and choose your favourite treatment. Experience the complete sensation of Balinese Massage. The traditional Balinese massage in our center is heaven sent healing for you to relieve your stress away. So, experience the inner joy and relaxation with us. Submerge yourself in nature’s sweet caress of tender, loving care through a traditional Balinese massage. More so, massages are traditional way of detoxifying the body to get rid of stress. It is a means of relaxing by applying pressure to stimulate the inner muscles. It has several health benefits like enhancing blood circulation and further allowing the body organs to perform at par. Hence, it promotes a healthy mind and body – mens sana in corpore sano.